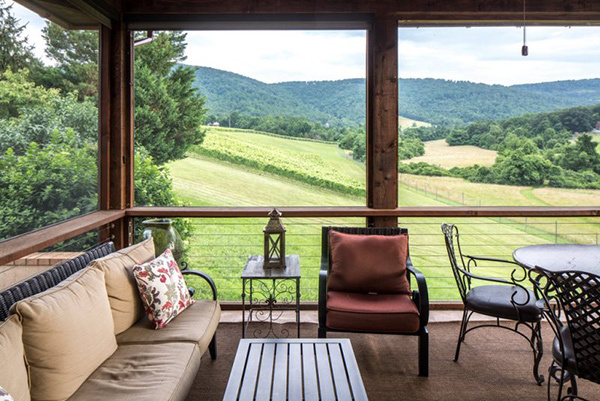 The Afton Mountain Vineyards Guest House is the perfect way to celebrate a romantic weekend or just a relaxing getaway! This two bedroom, two bath cottage is located in the heart of a beautiful mountain vineyard. the views that surround this property are breathtaking. Situated on the sunrise side of Afton Moutain, this property sits at 1000 feet in elevation. Enjoy sprawling views of grapevines out your back door and the panoramic mountain view. Equipped with a kitchen with gas range and stainless steel appliances. Queen sized master bedroom has its own en suite bath with a marble, double sink vanity, tiled walk in shower, and a deep tub perfect for a relaxing soak! The second bedroom is located on the terrace level and features a queen bed and a en suite bath as well.